On the 7th Episode of the PT Sports Debate Stiltz and Ush talk about all sorts of things ranging from the Grammys to the State of the Union. During this episode, we also talk about the Pro Bowl, Super Bowl (Prop Bets, Predictions, MVP, Matchups), and everything in between. This is our longest podcast yet, lasting about 50 minutes so we hope you enjoy and somehow make it to the end. Thanks for listening everybody, cheers! The hate of Richard Sherman has grown to a whole other level. I admit, I don’t care for the guy that much because of the way he carries himself on the field and for the Failmary game against my Packers. 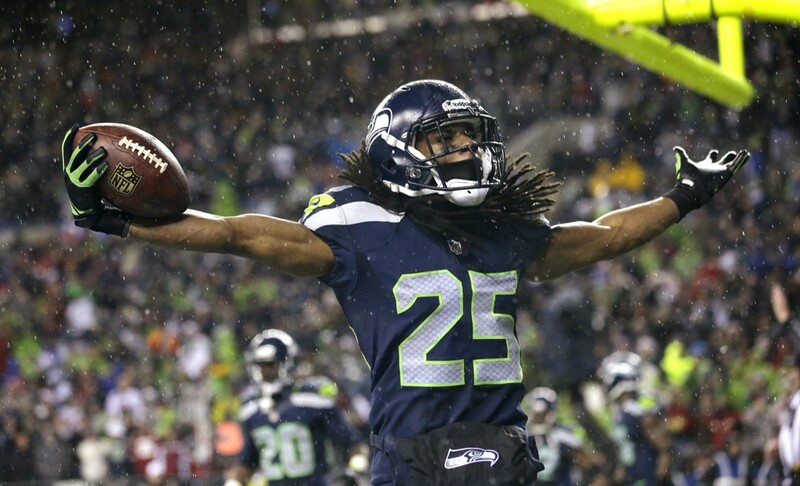 However, Sherman is one of the best cornerbacks in the league without question. When did we stop watching sports for entertainment? I know we don’t get together with our friends on the weekends to watch sports to learn about morality. Football is a sport based off of violence, laying out your opponent. Just because the man ranted live on National Television following the biggest play in the biggest game of his career does not constitute a reason to call him a thug. America is better than that, at least I thought we were. Not only did fans throw popcorn on an injured Navarro Bowman being carted off the field following a gruesome injury, but they take to social media to rip a man they know little about. They rip an entertainer who is being portrayed as a villain in the league in a WWE-like fashion. Throughout the years we have witnessed players who just play the game like Barry Sanders, and then there are players who like to make a scene like Terrell Owens. There are usually more headlines and debate over the controversial players who like to thrust that spotlight upon themselves. Richard Sherman talks a lot of talk, but more often than not he is backing up his words with great play. He epitomizes a player that you love when he’s playing for you but despise him when he’s not. I guess if you’re not an avid fan Sunday was your first time meeting Mr. Sherman. He has been that same exact way in his three years in the league, and he sure as hell isn’t changing for anyone. Let’s take a look at where he started in life. Now some players make it to the NFL strictly based off athletic ability, others have to work tirelessly and study the game. 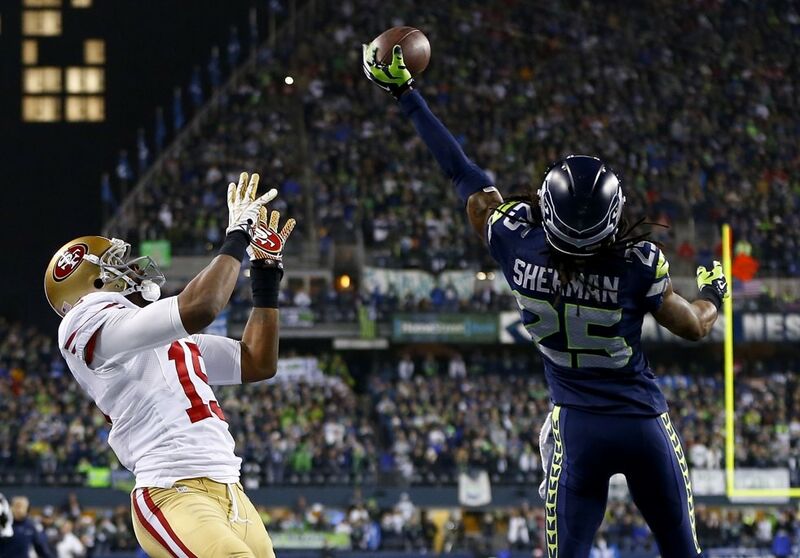 Here is an example of Richard Sherman living on tape. Him talking about tipping the ball into play reminds me of a play that will live on in infamy among Seahawks fans. This final video is a commercial that just dropped from Beats by Dre. Richard Sherman has 20 interceptions in his first three seasons in the league. His work ethic and numbers show that not only is he here to stay but the man is in his prime people. Peyton/DT/Wes/Eric Decker/JT won’t be concerned about the “Heel” version of Sherm. When Peyton takes the field Richard Sherman, the football player, will be on his mind. You can see the rest of our podcasts at http://ptsportsdebate.podbean.com or click them on the left hand side of the page. Thanks for the support, hope you guys enjoy. Cheers!